Today, cars are basically essential for transportation, but to buy a new car in Plano is generally very expensive and time-consuming. A used car is a more affordable option—but also more unpredictable. 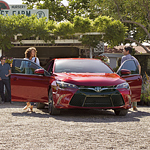 The Toyota Certified Pre-Owned program allows you to buy a used vehicle with confidence. Every car at Toyota Of Plano has been examined to make sure that it is in good condition so that you can confidently purchase your quality car. To ensure your satisfaction, Toyota Certified offers many benefits which include a 100,000 mile or seven-year Limited Powertrain Warranty. This warranty and the others that also come with your purchase are all transferable from one private owner to the next. This adds value to your car should you decide to sell it before the warranties are up. Don’t wait another day to find your local dealer and choose your car. You will never regret your decision to buy a Toyota Certified Pre-Owned vehicle. Plan a test drive today.